Comments: Broadleaf deciduous hybrid cross of an American Sycamore and Asian Maple. This species was developed for urban environments where resistance to polution is important. 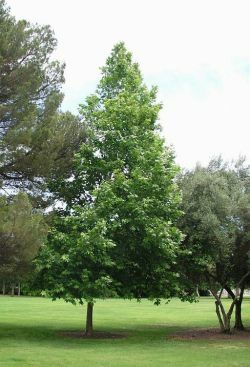 The London Plane has large (8" to 10" wide), deeply lobed, California Sycamore-like green leaves with prominent radiating veins, mottled bark, and 2 seed balls on the same pedicle. 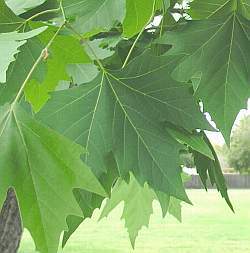 Though very similar in appearance to the California Sycamore, the London Plane leaves are larger, and lack the white felt-like hairs on the underside. Additionally, the London Plane lacks aruricles on the leave petioles (these are leafy extensions where the leaf attaches to the twig. Two varieties of London Plane planted locally are "Bloodgood" and "Yarwood." Nelson Kirk and Dan Rivera have contributed information for this description.